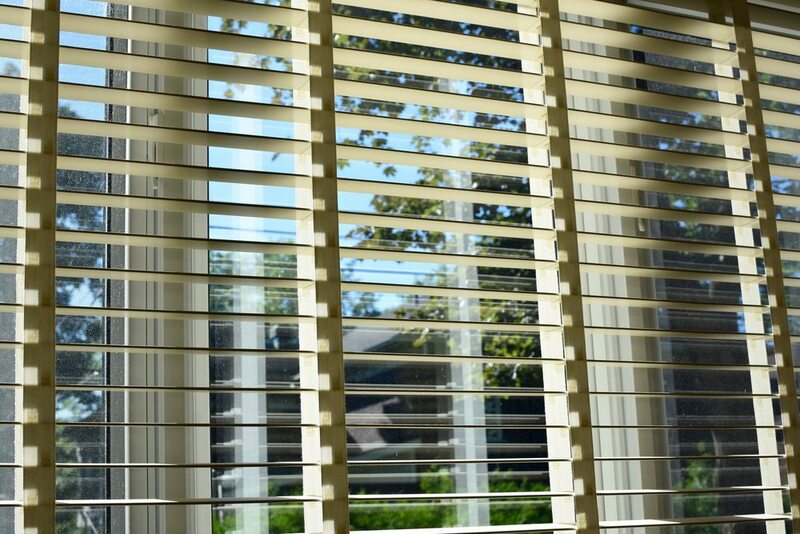 Brisbane and Gold Coast locals have been increasingly opting for wooden blinds due to their unmatched quality and appearance. With modern advancements in technology, there are now faux wood blinds that can achieve the same look with less maintenance and upfront expenses. In this article, we’re comparing wood and faux wood blinds. As the name suggests, faux wood blinds are simple imitations of wood blinds, they have the appearance of natural wood but are actually made of PVC/vinyl materials. PVC is durable, water-resistant and fire-retardant, meaning they are a safer option in modern housing. These blinds are constructed in slats that are highly durable and will not warp, crack or fade. In areas that have high moisture exposure, such as bathrooms and laundries, faux wood blinds are an excellent choice of installation. Houses in areas of extreme humidity and heat, such as Brisbane or the Gold Coast, can benefit from faux wood window fittings. Faux wood is extremely easy to clean as you are able to use any form of cleaning product and you aren’t at risk of damaging the fine grains of real wood. Due to their economic benefits, faux wood blinds achieve a sought-after “natural” look while fitting into any renovation budget. One downside of faux wood blinds is their tendency to be heavier than real wood, meaning they can be difficult to open completely and often block sections of natural light from entering a room. Many people opt for real hardwood blinds due to their pure sophistication and refined quality, offering a natural and organic feel to any room’s décor. Most wooden blinds are made from sustainable resources and offer a beautifully textured, fine grain appearance. This upper-market installation does require gentle treatment as harsh chemicals can fade or warp the slats and excess water will mark the wood. It is important to protect your blinds from splintering and fading by dusting them regularly and avoiding chemicals. Wood blinds offer exceptional insulation qualities for Brisbane and Gold Coast heat and can protect furniture and fine art from fading due to sunlight exposure. Real wood blinds are lightweight and have long lifespans, this is important to take into account when preparing for future renovations and maintenance. Hardwood blinds are available in many gorgeous stains and colours for a rich addition to your personal design preferences. If your budget can allow it and your blinds aren’t likely to be damaged by animals or children, opting for real wood blinds will never disappoint. When it comes to finding the perfect addition for your build or renovations, seeking professional advice can make all of the difference. Reputable blinds specialists can offer commitment-free consultations, measurements and quotes to help you retain peace-of-mind when making important decisions. Modern Blinds are Australian made, servicing Brisbane and the Gold Coast area with high-quality window coverings. Take a look at our extensive range of wood and faux wood blinds then call 07 5606 7661 (Gold Coast) or 07 3290 5777 (Brisbane) for any further enquiries.